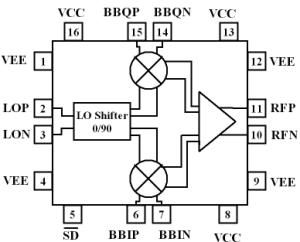 The ICQ2810 is a single chip, broadband quadrature modulator RFIC designed to be used from 250 MHz to 1000 MHz. The device provides high output power and features excellent I/Q amplitude and phase balance and a high output P1dB. The part needs a low LO drive level and provides a 50 Ohm output. Also available in 16-L TSSOP.